Yeah Waterworld was absolutely terrible. Here is one movie recommendation that I never thought I would make. Wonder Woman. I thought it was really good. Something like 92% on Rotten Tomatoes. Here is something that is really messed up though. Gal Gadot who had the leading role of Wonder Woman was only paid about $400,000. Yet support actor Chris Pine got something like $9 million. She might do well to get a new agent. But even that might not help too much because it's such a huge widespread problem. Take for example the USA women's soccer team makes pennies compared to what the men's team makes despite being more successful and having higher tv ratings. Etc, etc, etc. on3m@n@rmy wrote: Yeah Waterworld was absolutely terrible. The success of the movie gives her something to bargain with for the inevitable sequel. Chris Pine is like a poor mans Chris Hemsworth ! I thought the last few star Trek movies were pretty ordinary. Womens sport is basically semi amateur on the pay scale except for one or two sports like tennis, some athletics, and golf and maybe basketball, it's ridiculous for elite sports women to be earning peanuts but a lot of it probably has to do with TV viewing. A lot of people won't watch women's sport, even the better paid ones like tennis and golf let alone go and watch it live. Here's another article showing that Tweet (that's been quoted many times, even long after deleted and retracted) was wrong, and she was paid about the same as everyone else, and her future negotiating ability appears to be very strong. Fellas thanks for checking on that for me. That is one I don't mind being wrong about. My bad. Dark humor at its finest. An absolute classic of our cinematography. 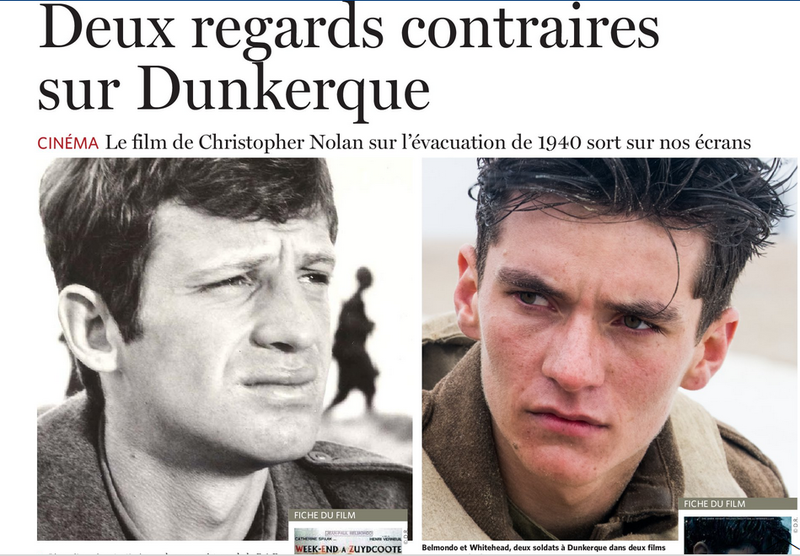 There was an interesting article in "Le Soir" last Wednesday about the release of "Dunkirk", here in Belgium. A comparison with Henri Verneuil's Weekend à Zuydcoote. It interested me because Henri Verneuil is easily my favourite director in French cinema, possibly my favourite director overall (very prolific in making good films) and actor Jean-Paul Belmondo, a legend of an actor. A stunt actor with irony and an ever so relaxed attitude, in my top5 favourite actors. However this was not my favourite Verneuil film but still the dialogues were there, as I recall them because it's been a long time since I last saw it. Christopher Nolan’s film about the 1940 evacuation is released on our screens. More than half a century after Henri Verneuil, Christopher Nolan is depicting the Battle of Dunkirk of May 1940. Two film about one and the same topic but that clash in every possible way. Weekend à Zuydcoote was a big production with 3,000 extras, military equipment of the time and Jean-Paul Belmondo. 3,000,000 admissions in France. A massive success. Dunkirk was shot in Dunkirk and completed in Los Angeles. With a Hollywoodian budget. In Imax! It had 6,000 extras and ships that were used for the 1940 evacuation. One side is General De Gaulle’s France and on the other side is Hollywood, its studios and its 11-figure industry. The topic is the same: the Battle of Dunkirk and the evacuation of the British (& French) troops to Britain after the allied disaster in May 1940. The setting is also Dunkirk and surroundings. 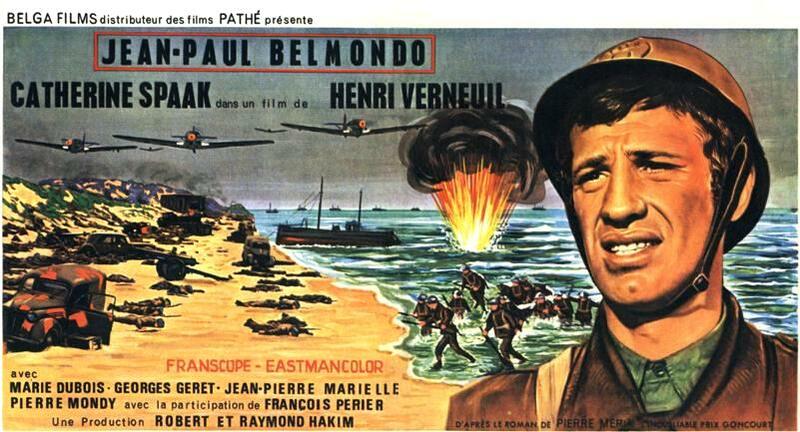 In 1964 Henri Verneuil adapts Robert Merle’s novel Weekend à Zuydcoote [English version is Weekend in Dunkirk, I think] (Goncourt Prize in 1949) starring young Jean-Paul Belmondo. The viewpoint is obviously French and a witness of its era. We are here 20 years after the war and the scars are still visible. No way is it possible to get back to it without any filter or even self-censorship. 57 years later Christopher Nolan, British director, adulated versatile genius in Hollywood is starting his first war film which he announces as an “almost experimental thriller”. Which it is! The viewpoint here is British and triple (young soldiers trying to get on board, RAF pilots and civilians on a merchant ship coming for help). Even if comparison is not reason, let us compare. So you are getting away? Oh, but I’m gonna get bored without you! With Verneuil the war is a pretext for social relationship. Weekend à Zuydcoote is a film about a band of mates, a real “Franchouillard” comedy [that is a very common term in French cinema to describe such comedies] with blowouts and puns despite a tragedy in the background. Let us remember that the film was released in 1964. General De Gaulle is in power. You are not looking at the war in the eyes, at least not in cinema! Chris Nolan obviously has a different approach. His film is a suffocating ‘huis-clos’ on the beach of Dunkirk, a sensorial thriller with only one question: are they going to survive? 3 The Rhythm It’s one of the key elements in the Nolan film. Dunkirk is a time-trial in chaos. The rhythm is relentless and supported by a very tensed soundtrack. On the other hand, Weekend à Zuydcoote, it’s as though there was no trouble. Life is beautiful in Dunkirk. Life is beautiful in France. The air is like a whistle worthy of the film “La chèvre” [very popular comedy by Francis Veber in the eighties starring Gérard Depardieu and Pierre Richard]. The soldiers are relaxed and reassuring. Belmondo is walking from one house to one regiment, casually, scruffy, drinks down a bottle of whiskard and then chooses to go and see the Brits in order to get on board as well which will take him out of this. He does not rejoice at leaving his country but living under these bombing is not pleasant. 4 The characters In Weekend à Zuydcoote the soldiers are adults though young. Most of them with families and children. They are chatting, drinking, talking about home. To put it simply, they are friends! The film is talkative and even has time to place a romance between Belmondo and a young girl from Dunkirk played by Catherine Spaak [French actress with Belgian roots!]. The woman’s role is then to admire the protective and reassuring soldier and by the same token, offering herself to him. Weekend à Zuydcoote is not exactly the feminist kind. The era was not either. In Dunkirk the only female character is a cook who is just passing by. The soldiers are young, most of them just teens. They don’t talk. You don’t know anything about them. They are living in the present time or rather surviving, alone or together with the first guy that they are encountering. On the French side, it’s yapping all the way. There is verb with most beautiful effet. Weekend à Zuydcoote is a literary film. No wonder it is based on a novel that won the Goncourt prize. Robert Merle even wrote the dialogues of the film. And like in every good French film of that era it’s gushing with sheared words which are making more effects than the bombings. The abbey is f*cking you! Oh Father, what is the problem? 5 The war and the historical viewpoint With Nolan, war is everywhere, almost physically palpable (the sound of German planes diving to the beach!). No flags, no morality, even less bravery. Just scare and survival instinct. On the contrary with Verneuil, the French soldier is not afraid. He’s brave and courageous. He’s relaxed at home, in this sweet France. It’s interesting to note that the horrors of the war can only be felt when the ship with Belmondo on board is leaving Dunkirk and France. Then the war is exposed the way it is: frightening, destructive, real. It destroys friendships and loves. It is smearing France. Conclusion: Weekend à Zuydcoote is depicting a courageous France, left to its own fate but which is after a victor, supporting the Gaullist assumption that all France (or almost) was in the resistance. Breaking Away (1979) - Mostly fun for bicycle people, but what I don't get is why Dave's dad is so vehemently against "Itys", or any other nationality. Play Misty For Me (1971) - Crikes, I don't mind slow movies at all, but was this one about 30 minutes too long because of Clint Eastwood's self-indulgence as a first time director? Do The Right Thing (1989) - Is this whole thing between blacks and Italians still going on in Bed-Stuy nowadays? Wouldn't surprise me, but then I've never lived there. Otherwise an excellent flick, though, methinks. I thought Breaking Away was a fun movie. Dennis Christopher and Dennis Quaid were very good. Play Misty For Me was so so and Do the Right Thing I think is Spike Lee's best movie, very good film. Straight Outta Compton (2015) - As a movie I think it's okay, and I admittedly do like a handful of gangsta rap songs. But this is no documentary, seeing as some very important and factual tidbits had been omitted. I've seen it a couple of times... the Russian accents are funny (especially Donald Sutherland's and Joss Ackland's), but otherwise it's a pretty good flick. 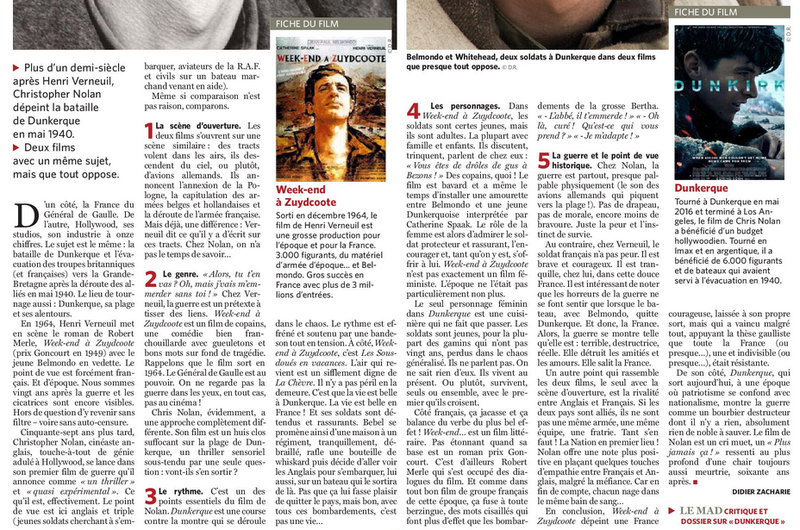 Echoes wrote: There was an interesting article in "Le Soir" last Wednesday about the release of "Dunkirk", here in Belgium. Exclusive (1992) - a thriller w/Suzanne Somers post her Chrissy Snow/Three's Company days, terrible flick. Naked Lie (1989) - a thriller w/Victoria Principal post her Pam Ewing/Dallas days, terrible flick. Criminal Law (1988) - a legal thriller with a young Kevin Bacon and young Gary Oldman, Oldman's overacting is so atrocious it's a minor miracle he ever made it into the big time in the 90s. His giant hair is a sight to behold, though. Terrible flick. Getting Gotti (1994) - Another cheesy made-for-TV movie, this time with Lorraine Bracco. Why does she talk so slooooooooow? I think she was bearable in The Sopranos because she had a fairly small role, but as a lead who does all the talking it's terribly annoying. Anyhoo, the subject matter of the mob itself is interesting, I watched those trashy reality TV shows Mob Wives and Growing Up Gotti as well way back when. Getting Gotti is on the same level as far as quality is concerned, but if the mob interests you it's worth the suffering. The Untouchables (1987) - Wow, it's as bad as I remember first seeing it back in the late 80s. Most of the time it's very Disney, but then they throw in a bit of violence and some bad words. No Godfather of Godfather II this one is! Tricycle Rider wrote: The Untouchables (1987) - Wow, it's as bad as I remember first seeing it back in the late 80s. Typical De Palma. Style over substance. I thought it was okay. One or two good scenes and the rest was blah. Glad to see other people disliked it. I watched it when about 23 or so, I thought it was so Manichean, good vs evil. Only the Sean Connery character was interesting. A racist on the good side. And then there's the final scene with the pram, just over the top ... Hollywoodian entertainment business. But when I've discussed it with some French left-wingers, I was just ridiculed for hating it. Echoes wrote: And then there's the final scene with the pram, just over the top ... Hollywoodian entertainment business. But when I've discussed it with some French left-wingers, I was just ridiculed for hating it. Oh yes. That scene was just so cringe-worthy I actually wanted to push the damn woman and her stroller off (or up) the stairs myself! A Murder of Crows (1998) - With Cuba Gooding, Jr. and Tom Berenger I went into it thinking it had potential to be a great murder mystery, instead it just ended up being kinda cheesy. But they had great shots of New Orleans and Key West, so there's that.